In May 2012, after successfully coping with a humanitarian crisis, MSF handed over its project in Hiloweyn refugee camp to an Ethiopian refugee agency. Somali refugees in Hiloweyn camp. When MSF expanded medical activities in the Liben refugee camps in southern Ethiopia in May 2011, an average of 300 refugees were crossing the border every day, with peaks of 1,500 a day. Years of civil war in Somalia, compounded by a drought that hit the Horn of Africa early last year, caused widespread malnutrition, while aid agencies could extend little assistance inside Somalia itself. The refugees that were crossing the border to Ethiopia had sometimes walked for weeks in search of safety and assistance. The majority of the incoming refugee population in July and August 2011 suffered from malnutrition and opportunistic infections. Since then, in the Hiloweyn camp alone, MSF has treated over 50,000 outpatients—including nearly 10,000 children and young adults for malnutrition—and 1,000 inpatient admissions. 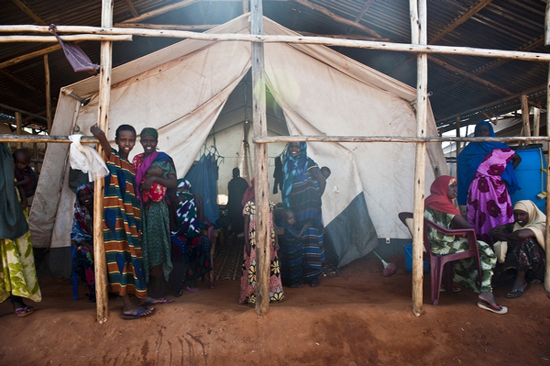 MSF constructed emergency medical facilities in the newly opened Hiloweyn and Bur Amino refugee camps to provide the infrastructure for medical activities in an unforgiving environment. MSF also expanded the infrastructure of the Dolo Ado Health Center with new surgical, post-operative, and maternity wards, including a new laboratory to serve the local host population and act as a referral center for refugees. In May 2012, MSF handed over the infrastructure and most of the programs in Hiloweyn camp to ARRA. MSF continues to work in all five camps in Liben with stabilization centers for severely malnourished children with medical complications. Additionally, MSF provides primary and secondary health care in the newest camp, Bur Amino, where an average of 2,000 new refugees are settled per month. MSF also works in partnership with the Ethiopian Ministry of Health to provide emergency surgical care and stabilization in the Dolo Ado Health Center. MSF has been working in Somalia continuously since 1991. MSF relies solely on private charitable donations for its work in Somalia and does not accept any government funding. From May to December 2011, MSF ran 22 projects in many different parts of Somalia and in refugee camps for Somalis in Ethiopia and Kenya. In this period, at the height of the crisis, MSF treated over 78,500 patients for severe malnutrition and over 30,000 for moderate malnutrition, over 7,200 patients for measles, and vaccinated over 255,000 persons against disease in the Horn of Africa. MSF assisted in over 6,000 deliveries and provided over 537,500 outpatient consultations. The war in Somalia is now entering its twenty-first year. After the drought and the enormous crisis of last year, people survive and live hand-to-mouth and are still highly vulnerable to infections, disease, and malnourishment. Inside Somalia, MSF will not step up its activities or open up new projects until its two colleagues—Montserrat Serra and Blanca Thiebaut, abducted in Dadaab and held in Somalia since October 2011—are reunited with their families.